This new auger filler has excellent performances and is easy to clean. This new version is based on our well proven LWF weight filler and allows filling of bag in box but also drums, pails, jerrycan, etc. thanks to quick change attachments. 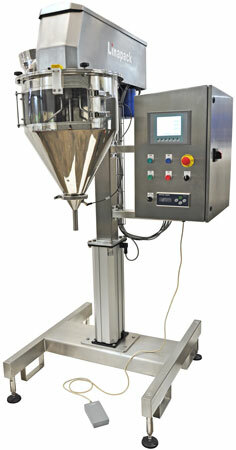 This new rotary sorters range allows feeding of wide mouth PET preforms to a blowing machine. 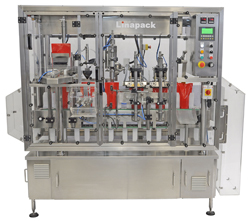 This new machine range allows filling through the spout and capping of pouches and side gusset bags with liquid and viscous products. This is used where fill and seal machines are not suitable due to the spout position on the pack. 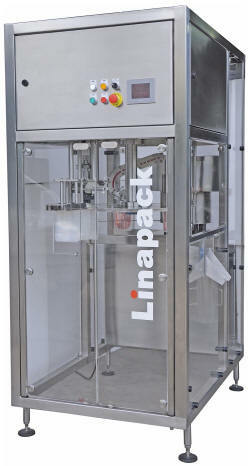 This new version of the Linapack piston dosing pump offers ease of use thanks to a complete control on touch screen of all filling parameters (volume, acceleration and deceleration, speed) and an improved flow that reduces foam and splashing. All this combined, the servo driven piston coupled with an automatic packaging machine allows for a higher overall speed and an increased quality. Facing a growing demand for lower speed but high quality and fully automatic fill and seal machines for stand-up pouches, we have released at the Propak show in bangkok the MINI series. The MINI machines allows production speed up to 20 packs/minutes but remain full featured. This machine is an extension of the triplex version LFS300-3X, particularly adapted to small stand-up pouches up to around 300ml. The quadro version allows production speed up to 120 packs/minutes. 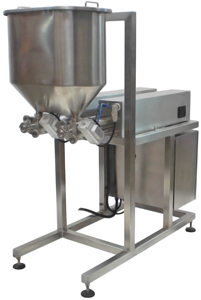 To answer the growing demand of our clients, we have developed a semi-automatic filler for liquid products in large containers. 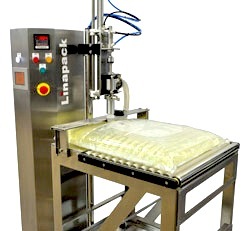 As most products packed in pouches are also packed in large containers, this machine is a great companion to our automatic pouch fillers.